Vina Cristina is a typical country finca of this region of White Villages. Set in its own garden backed by mountains and fields with sheep grazing and beautiful views towards Ronda. It has its own built in barbecue under the olive trees. You can dine on the patio under the vine looking out over the countryside. There is an orchard, stream and garden with the mountains behind. In the main room is a large open fireplace, CD player/ books and local maps. The dining area can seat 8. The bedrooms are comfortable; one double and one twin each with a wood burning stove and decorated with simplicity to suit the style of this lovely place. Bedlinen and towels are supplied. The kitchen is tiled with Spanish tiles and a granite worktop there is a gas cooker, microwave, washing machine, fridge/freezer and all kitchen equipment. We leave basic dry goods for your use. The blue and white bathroom has a bath, shower, loo, handbasin and heated towel rail. There is also a hair dryer and hot water bottles for cooler weather. We supply one sack of logs for the cooler weather. We had a really fantastic stay in this hidden paradise - only an hour away from Marbella! Really comfortable, fantastic views and ideal for a complete disconnection from the hustle and bustle of city life. 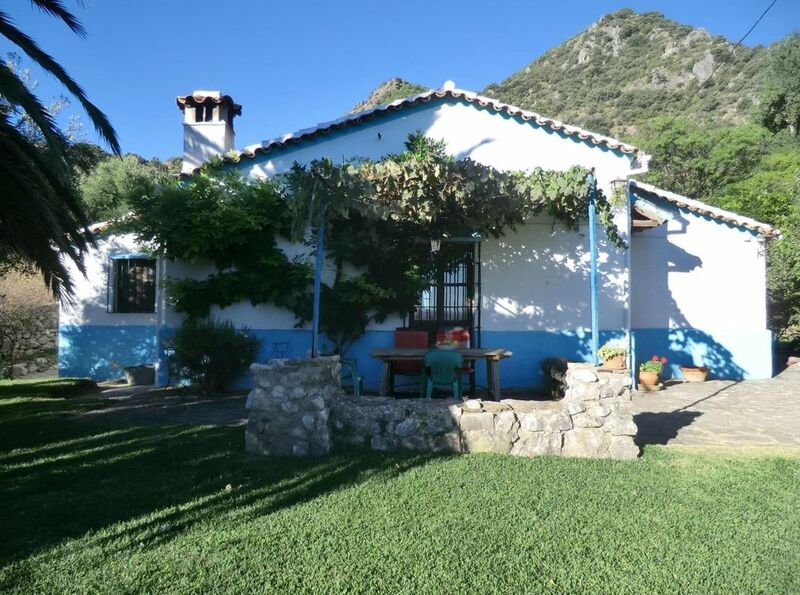 The location is ideal, as it is a 5 minute drive to the stunning village of Grazalema (with its friendly locals), as well as being the perfect base for exploring the area. We would highly recommend this venue and we look forward to a return visit. This was a wonderful place to spend Christmas week. Beautifully furnished with locally built and antiquish cupboards, tables and amazing Russian dolls door. Great fireplace and there are even woodburners in the bedrooms although we didn't use those much as they were rather too efficient. No WiFi but 3G/4G sufficient to create WiFi hotspot, stream music from Spotify, etc. Electrics slightly quirky - electric heaters needed unplugging if using the kettle, but no problem and it was nice having them for instant heat when coming in from the cold. Kitchen has excellent large gas range and oven so great for cooking. Lots of staples- salt, sugar, pepper, some spices there so no need to buy everything...but lacks a can opener! Eroski and Dia supermarkets off main square in Grazalema were adequate. Butcher shop excellent but no fresh meat on display so you have to ask for what you want. Lots of panaderias and shops selling delicious local cheeses, hams, honey, etc with quite extended opening hours. Tons of restaurants in town for such a small place, nearly all open in December. Tourist information guy v helpful, knowledgeable and speaks English well, can give you walking permits for the reserve areas on the day or in advance. We had a couple of gorgeous sunny days walking in high mountains - Simancon-Reloj walk highly recommended. Also had lots of cloudy, rainy days and found some pretty good lower level walks. Garganta Verde was particularly stunning. Vultures so close you can hear the wind in their feathers. Also saw lots of wild goats in mountains closer to Grazalema. We are very happy that you had a good time and thanks for a great review. We checked into vina cristina on Sunday 17/9/2017 for a 6 night stay. On arrival the first thing that we noticed was a large hand written sign on the toilet asking us not to flush any toilet paper down the toilet but to place all used paper in the bin provided next to the toilet, as any flushed paper will block the septic tank. This fact is not advertised!!! The stench of raw sewage that came out through the shower, bath and hand basin drains was vile. It permeated through the house. After 4 nights we could not take the stench any longer and sought alternative accommodation, we left vina Cristina 2 days prior to our due departure. We have traveled extensively, including 3rd world countries that have better sanitation than this property. Also note the property does not have internet or wifi connection. There are incessant barking dogs day and night. The water pump is located outside the bedroom window which is very disruptive throughout the night. The rubber seals of the washing machine are mouldy. The ironing board cover is torn to shreds. The plunge pool is broken and unable to be used. The house has a CD player and a few of the owners cds, but as most people now have their music stores on devices, iPhone/iPad it would be beneficial to have a speaker to enable you to be able to plug in your device to listen to your own music. Vina Cristina needs a lot of work done to bring this accomodation up to a standard suitable to rent out. We have not asked the owner for compensation. I am sorry to hear that you did not enjoy your stay in Grazalema.It is obviosuly very difficult to respond and much depends on personal expectations and needs. We also have had recently though other websites extreemly good reviews. Below is an example of the one from clients who where the week before you,, they gave 5 stars.! Obviously we will take into account your coments. The property is in a beautiful, peaceful location with a large garden which is well tended. The village of Grazalema is about 4km away and is the nicest Spanish pueblo we have visited. The only walking route in was along the main road which at night was unsafe after dark. Grazalema has plenty of restaurants to choose from and we enjoyed all six at which we dined. The weather was glorious for all 7 of our days and we were fortunate to see the vultures overhead. There are no games at the house (boules, bat & ball etc) to allow full enjoyment of the garden. The sun loungers are well past their best, still the same ones as those referred to in a 2014 comment from the owner advising that care is needed when using the sun loungers.... Only one of the four was really useable and even this was dangerous as you could get folded up inside it if you were not careful. The patio chairs are the plastic stacking type, also old and ready for replacing. The kitchen is reasonably fitted out with a nice aga style range and granite work tops. There were no beer/long drink glasses, but adequate wine glasses. The fridge freezer was not working during our stay but this was quickly replaced with a new one by Esteban the caretaker. The beds are comfortable but the bedroom furniture does not offer much storage space. Neither of the two wardrobes have a hanging rail & only 10 coat hangers were available for our party of 3. Hanging space was limited to a couple of hooks on the back of the doors. A proportion of each wardrobe is filled with winter bedding, so not full shelf space either. Unfortunately during our stay, a family of rats had made home in the roof space and made daily appearances running along the vine to collect grapes. Although quite cute, not really what you want to experience. Despite emailing and texting the property manager about the rats we didn't get a reply until the day after our return home. No offer of recompense has been received despite the problems we encountered. Thank you very much. We are very happy that you enjoyed your stay. We did return to Vina Cristina after last year's highly enjoyable visit and it was just as good again. Coming in June this time, rather than July, meant that it was not too hot for us to walk more extensively in the area each morning, but it was still a delight to rest in the peaceful surroundings of the cottage each afternoon. We never tired of the views around and devoted considerable time to just watching the vultures gliding overhead. We also spent more time in Grazalema itself on this visit and were happy to do our day-to-day shopping there without having to find somewhere bigger. Thanks again to Judith for the use of her home from home. Thank you so much. The perfect guests!